If you want your order shipped to a name or address different from that on your credit card, please fill out and submit the form at the bottom of this page. If you are having DVDs shipped to an address outside of the USA, please Purchase the Appropriate International Shipping Charge Here. $42, domestic shipping included. 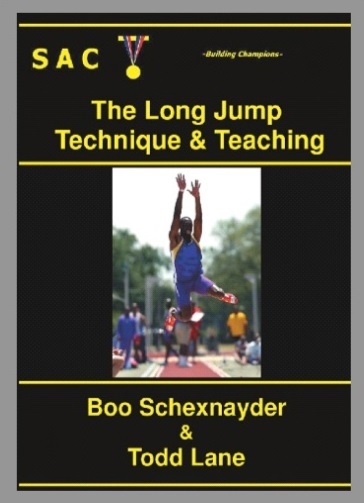 In this DVD, Boo Schexnayder provides a complete how-to guide for designing, performing, and administering plyometric training. 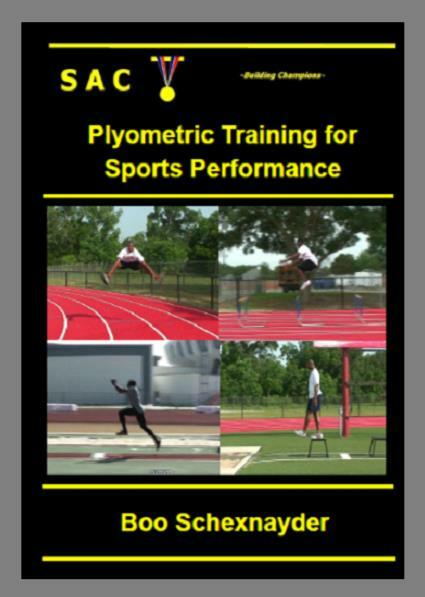 In response to many requests, here is provided to you the user’s manual for the use of all Plyometric multijump exercises.This DVD is a great accompaniment to our Exercises for Sports Performance Training DVD, showing you in great detail how to use all different types of plyometric exercises in your program. Details include categorization, technical teaching, workout construction, exercise selection, and planning. 56 minutes. $40, domestic shipping included. 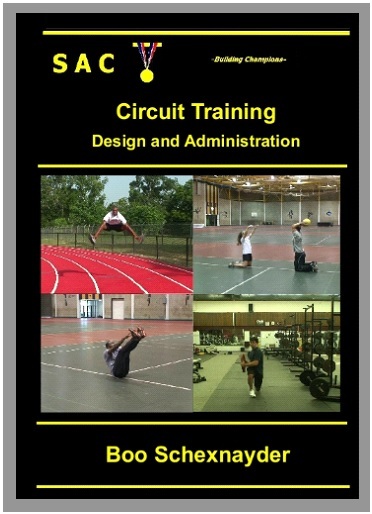 In this DVD, Boo Schexnayder provides a complete how-to guide for designing, performing, and administering circuit training. In response to many requests, here is provided to you the user’s manual for the use of General Strength, Medicine Balls, In Place Jumps, and Weight Circuits. 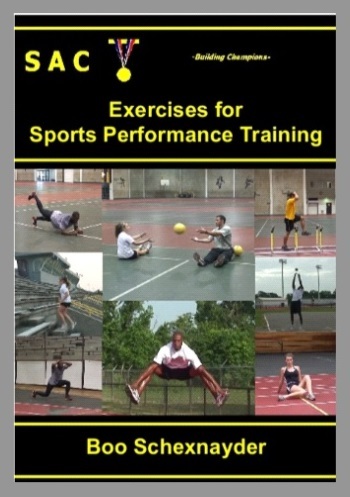 This DVD is the perfect accompaniment to our Exercises for Sports Performance Training and Weight Training for Speed, Power, and Sports Performance DVDs, showing you in great detail how to use that arsenal of exercises (or your own) in your program. Learn how to train fitness, aid restoration, avoid injury, beat bad weather, and much more through Circuit Training. 57 minutes. $42, domestic shipping included. 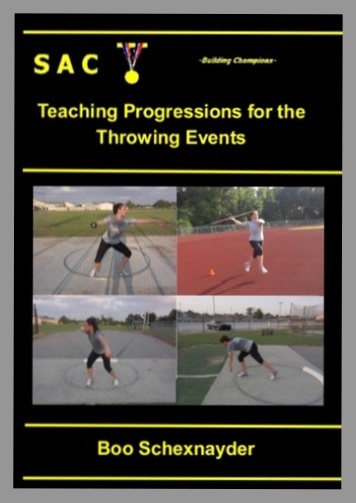 In this huge DVD, Boo Schexnayder provides the same smooth, seamless teaching approach used in other SAC DVDs to the throwing events. These ten drill sequences are perfect for starting throwers from scratch, or to eliminate bad habits with older throwers. He provides three simple teaching progressions to teach positioning, strike, and footwork fundamentals in the delivery. You also get three series designed to implement the glide, turns, and crossovers. Finally, you also get event specific drill sequences for the glide shot put, discus, rotational shot put, and javelin. The hammer is not covered in this DVD. As he goes through each progression, he gives you key technical points and where in the drill sequence each should be introduced. 69 minutes. $39, domestic shipping included. In this enormous High Jump DVD, Boo Schexnayder breaks down all phases of the event in detail, using graphically enhanced video to clearly illustrate every key position and movement. Detailed, step by step progressions are shown to teach curve related aspects of the event, takeoff positions and movements, and flight patterns. Technique issues are continuously related to common errors like sitting on the bar, falling on the bar, and jumping into the bar. Of special interest are sections providing step by step, detailed progressions for establishing approaches for beginners, a section on special coaching tricks, and a simplfied triangulation system. The DVD includes and identifies special high level technical sections that make it a great resource for every level of High Jumper. 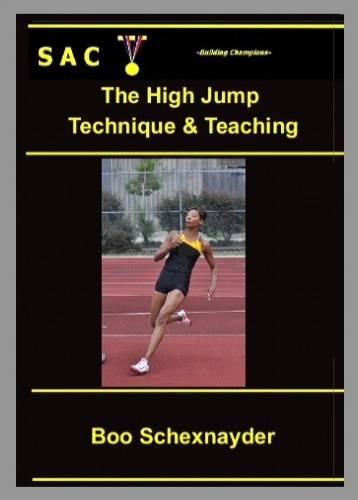 Because of space limitations the teaching progressions in this DVD are high jump specific, if you are interested in generalized teaching progressions we suggest you purchase the Long Jump DVD. 68 minutes. $39, domestic shipping included. 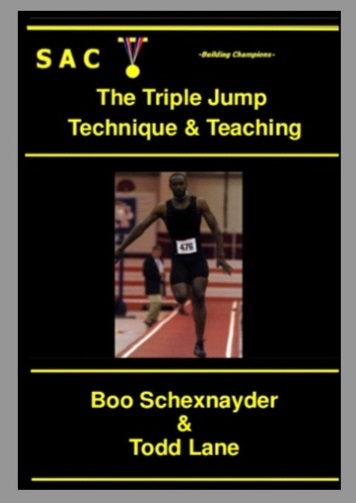 This is the most complete Triple Jump DVD you will find anywhere. Boo Schexnayder and Todd Lane break down all phases of the event in detail, using graphically enhanced video to clearly illustrate every key position and movement. Detailed, step by step teaching progressions are shown and cues given for bounding skills and the event itself. Of special interest is a section dedicated to fixing the troublesome second phase, using flowchart analysis to take you to the roots of step phase problems. Also included are tips for teaching technique and many many other extra topics. The DVD includes and identifies special high level technical sections that make it a great resource for every level of Triple Jumper. Because of space limitations this DVD does not go into great detail about the approach run, if you are interested in that information we suggest you purchase the Long Jump DVD. 63 minutes. $42, domestic shipping included. In this giant DVD, Boo Schexnayder explains types of strength and lifts, then gives detailed, step by step teaching progressions for the Olympic Lifts and specific technique pointers for Squats, the Bench Press, and Split Position lifts. The DVD contains demonstrations of his entire weight training inventory, including bodybuilding circuits and remedial exercises, nearly 100 in all. He then gives simple rules and guidelines for forming your program, how to fit the weight training with training done outside the weightroom, gives precise advice on sets, reps, intensities and recoveries for all lifts at any time of year, and gives you his phase by phase periodization model. He finishes by sharing his unique maxing out and testing system with you. 66 minutes. $38, domestic shipping included. In this huge DVD Boo Schexnayder takes you through his entire training inventory… every exercise is demonstrated for you. Warmup Routines, Static and Dynamic Flexibility Routines, Sprint Drills, Hurdle Skill and Mobility Circuits are included. All Plyometric and Multijump exercises are shown. Multithrow and Medicine Ball Routines are shown, and the huge General Strength section makes it a great tool for younger athletes. 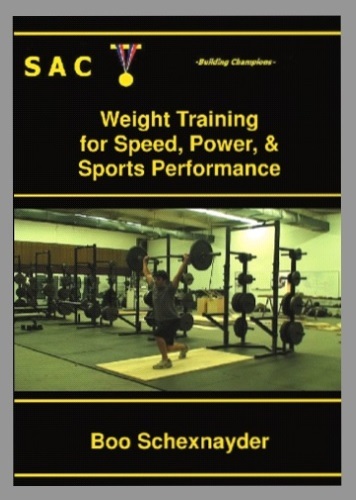 Please note this DVD does not cover training design, but includes the names and demonstrations of over 40 circuits and over 400 exercises, organized by category, intensity, and circuit. This DVD is the video accompaniment of the Training Inventory download available on our website. No audio, 56 minutes. $39, domestic shipping included. This is the most complete Long Jump DVD you will find anywhere. Boo Schexnayder and Todd Lane break down all phases of the event in detail, using graphically enhanced video to clearly illustrate every key position and movement. Detailed, step by step teaching progressions are shown and cues given and explained for every phase of the event. Also included are tips for teaching technique, managing approach accuracy, assembling an approach from scratch, using checkmarks, improving landings, and many many other extra topics. The DVD includes and identifies special high level technical sections that make it a great resource for every level of Long Jumper. 56 minutes. If you need to input a different shipping address, please submit the form below.